How should space mining be regulated? At the Canadian Institute of Mining’s annual convention, NASA scientists said exploration and prospecting of celestial bodies like the moon or asteroids is decades away, but even so this shouldn’t stop regulations from being well established in advance. At the event, concerns were raised that ownership and management of resources in outer space are still far from being resolved. Who owns stuff in space? Joe Hinzer, a Canadian geologists, suggests mining in space could be modeled after mining on Earth, citing regulations currently in place set forth by an international committee under a United Nations umbrella. “I think that’s the kind of approach that might work for extraterrestrial stuff as well,” he said. Hinzer also cites the European Union as an example, which has its own dedicated legal framework and parliament. However, these are more geared toward sustainable mining through targeted initiatives and research funding. Mining in outer space is much more troublesome because there currently isn’t (and hopefully never will be) any country that owns a piece of land on the moon or asteroid. Over the years, some daring entrepreneurs announced publicly plans of mining asteroids. Some of these asteroids, by rough estimates, can contain more gold, platinum, cobalt, iridium, and many, many other precious or industrial metals than in the whole planet. One such venture is called Planetary Resources, and lists Google Chief Executive Larry Page, Google Executive Chairman Eric Schmidt, director James Cameron and entrepreneur Ross Perot Jr. as partners. Studies show that the moon has twenty times more titanium and platinum than anywhere on Earth, along with helium 3, a rare isotope of helium, which is nonexistent on our planet, that many feel could be the future of energy on Earth and in space. He did mention, however, that there are programs in development researching the possibility of sending robotic probes, maybe by the swarms, to test the feasibility of mining the moon. “They can be accomplished in the near term, in five to 10 years,” Gruener added. One of the focus of such a mission is ice water that’s already been discovered in lunar craters. “The hope is we can separate the water from the other chemical constituents and then use the water to drink, use the oxygen to breathe and use the hydrogen and oxygen as rocket propellants,” he said. Will entrepreneurs usher in a new space age, akin to how business exploited technology to improve our lives for better or worse? Challenges aside, the prospects of (inter)planetary economy growth are huge and considering we’re currently using up 1.5 Earths each year demands that we direct our ventures to other worlds, if humanity isn’t keen on quenching its greed at least. First and foremost, however, it’s not clear if any venture of this kind is legal. It’s not quite clear if it’s illegal either. The foundational document that governs doing stuff in space is the 1967 Outer Space Treaty, on which the United States, Russia, China, and more than 100 other countries are signatories. It’s one of the five international treaties and agreements that govern activities in space as set forth by the United Nations Office for Outer Space Affairs (UNOOSA), an international body tasked with establishing space laws and overseeing peaceful cooperation in space. The treaty specifically prohibits nations from deploying nuclear weapons in space or on celestial bodies, forbids claims to celestial real estate and reads that private space ventures are allowed. Joanne Gabrynowicz, a space lawyer and editor emeritus of the Journal of Space Law at the University of Mississippi School of Law, says that things are peaceful and easy to enforce now because there’s yet no way to access those resources. Once the technology is in place, quarrels as to whom should have the right claim to these resources are bound to happen. With this in mind, it’s best to clarify space mining years before the necessary technology is introduced. In September last year, a House subcommittee discussed a new law that would explicitly give companies ownership over any materials they extract from an asteroid. Experts, however, disagree over whether such a bill would be compatible with international law. As always, the bill involves exploiting loopholes. “Outer space, including the moon and other celestial bodies, is not subject to national appropriation by claim of sovereignty, by means of use or occupation, or by any other means,” reads the 1967 Outer Space Treaty. Do you see something missing? Well, the treaty seems to be geared toward nations, but in theory it might not apply to private companies. At the same time, the treaty also specifies that countries are responsible for ensuring that private individuals and corporations within their borders abide by all the terms of the treaty. This means that the US would be forced not to allow Planetary Resource, for instance, to exert any claim of ownership or exploitation. But there’s another provision in the document: “Outer space, including the moon and other celestial bodies, shall be free for exploration and use by all States.” Doesn’t mining fall under use? Some experts think so, and argue that any material extracted from celestial bodies belongs to the entity who performed the extraction. As an example, they cite the case of NASA which claimed ownership of 842 pounds of lunar rock collected during the Apollo missions. 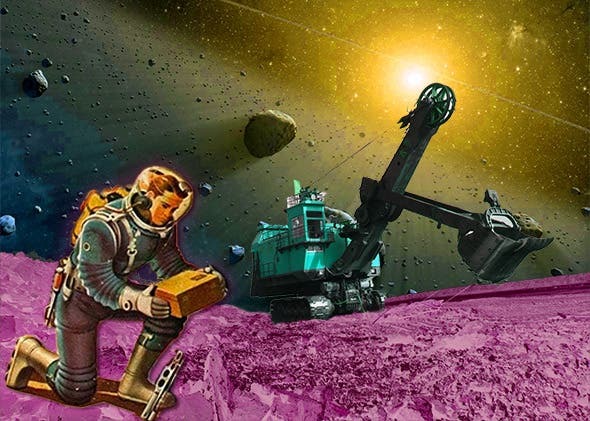 For now, it’s not clear whether the bill, called the Asteroids Act, will pass but it’s a first step in establishing some clear guidelines concerning space mining. Until then, no company will be prepared to shovel billions. It’s already risky, nevermind a potential lawsuit – no one would do it. There’s no stopping “putting flags” on matter, whether it’s Antarctic ice, an island in the Pacific or the surface of the moon. Humans seem to have an innate sense for property. Mine, mine, mine. Even in outer space. Yeesh.